The Scottish Government and the National Archives of Scotland (NAS) are releasing the documents early as part of International Right to Know Day. 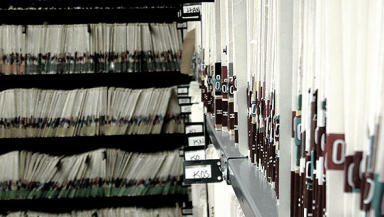 Around 4,000 Government files that were due to have remained closed for another 15 years have been made available. The files from the period 1979-1983 are to be made available for public viewing with more to be released next year. Minister for Parliamentary Business Bruce Crawford opened the ‘An Open Secret’ exhibition at the NAS on Monday. He said: “Principles of openness and transparency are essential parts of open democratic government and responsive public services. "The opening of these files has the potential to give us all a greater insight into the information gathering and decision making process within Government. “I am sure there will be much in these files to interest historians but also the wider public. "The Scottish Government will continue to move in the direction of greater open-ness and transparency." George MacKenzie, Keeper of the Records of Scotland, said: "I welcome this new release of government information. The first tranche adds significantly to the range of historical information available to researchers."